How do we identify our selves with the spaces we use and how do we navigate with the many obstacles the urban environment contains? Living in the city means to constantly negotiate spaces as well as navigate space. This becomes more difficult under the density aspect as well as the mobility aspects. Also the cycles of change are very short and frequent adaptations require constant reorientation. Aspects of repetition and routine play an important role in the navigation of everyday situations. Being familiar with the aspects makes this task a lot easier. However, as soon as there are changes, new features or temporary obstacles, those have to be integrated. Even more difficult such tasks are for people with disabilities. Here people also have to deal with obstacles built into the urban landscape, simply because someone ignored additional needs. Megafon is a project to investigate and map these obstacles using collaborative and user generated methods. Image by megafon.net / Geneva obstacle map 2008. Based on Google Maps with clickable content. Click on image for the interactive map. They work with focus groups and equip their participants with a camera and GPS to document their experiences in everyday situations. 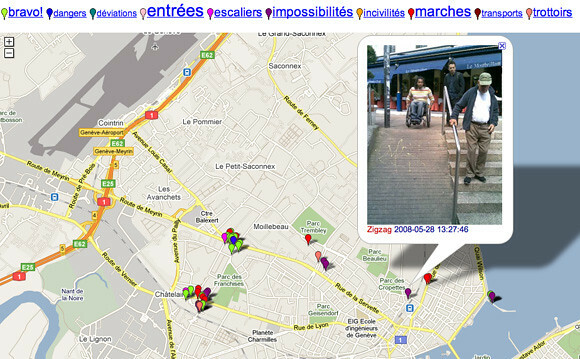 The images were uploaded directly to the internet feeding in to a realtime map of the city. Two of these cities are Barcelona, Spain and Geneva, Switzerland. The resulting maps a very detailed and visualise a very specific perspective on the city. 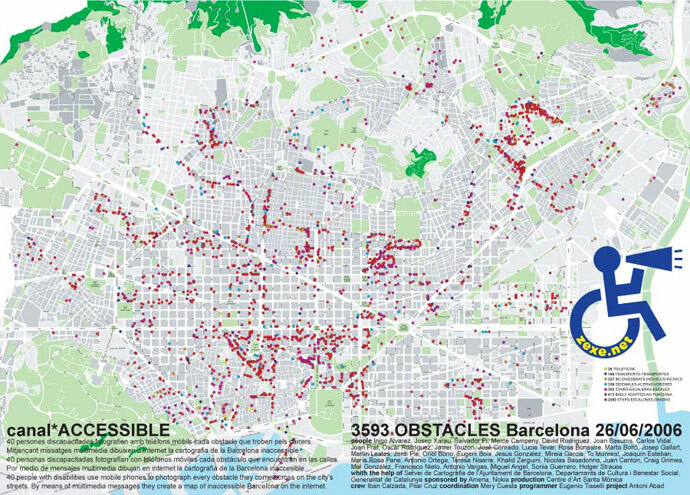 Image by megafon.net / Barcelona obstacle map 2006.